Monty Oum has created some epic animated fight videos involving popular video game characters like Haloid and Dead Fantasy. He’s currently working with Rooster Teeth on Red vs. Blue. We got the chance to chat with the animator as he talks about his animation career and his collaboration with Rooster Teeth for his upcoming project, RWBY. John “Spartan” Nguyen: Hello Monty, how’s it going? Monty Oum: Hey, good. How are you doing? John: Doing good, doing good! Yeah, I’ve been checking out the trailers recently for RWBY and it’s looking pretty sweet! John: Time for a brief history lesson. How’d you get into just animation? I mean, the long answer to that is, you know, 20, 30, years, well not 30, but it was like 15 or 20 years of just being interested in it. The short answer is, I’ve always had these tools, I didn’t start using them until about maybe eight years ago where I said, “Well, I should be doing something with this, and I had a theory about if I did this, this way, maybe it would work!” And it did! John: And everybody loves it! John: I guess when did you find out, it was like your calling. Monty Oum: Well, I mean, it took a while. I made a few attempts. The thing that really got me was seeing that other people were doing this sort of thing. Not the exact same sort of thing but running the videos from NewGround or things on other sites where people were using flash to such a maximum capacity. I was like, well, these guys are capable of telling the story with just this limited tool set and so when I started I was – I just felt like I needed to do my version. It took a few years, and there were definitely bumps along the way. It really started picking up when I did Haloid, and I was just certain that this one was going to work! John: You did Haloid and Dead Fantasy, and they all became a big hit. 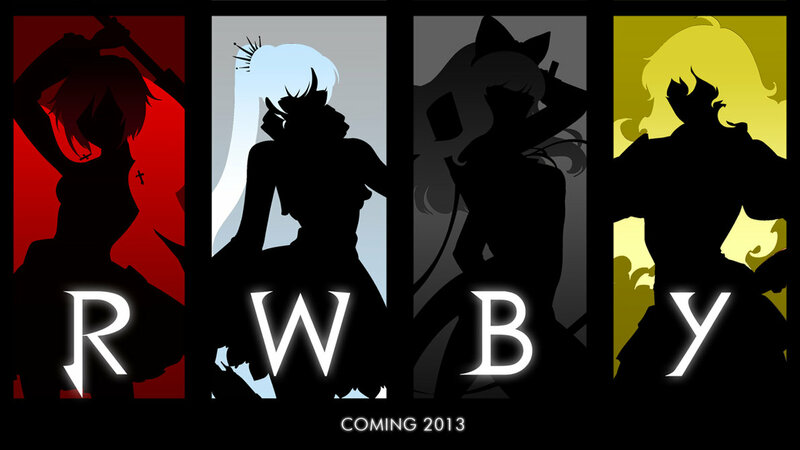 And now you have the upcoming RWBY. John: Yeah! And can you tell us about RWBY? Monty Oum: There are different elements of RWBY that – just like animation, part of it is only a few months, and part of it is many, many years of my life. The things that I’ve identified and have been putting into the show are the archetypes and characters that have always been prevalent to storytelling that I’ve liked. But the things of recent are, well now these characters need names. They need something to do, and they need motivation and an antagonist/protagonist, etc. Story-wise that’s been happening over the last few months. I give maybe breakdowns, ideas, theories on characters with emphasis to the two main writers, Miles and Carrie. They work with me very closely, and we pitch a few ideas (like the bulk of the script honestly). We hinted at and sometimes talked about the four girls. Two of them have already released trailers. The team is called RWBY and story-wise it was a rule that I set up for – not even story-wise but just character-wise and overall. The first rule that I came up with for this show, which governed pretty much everything until this day, was that I wanted the story to be about color. I wanted color to be very relevant. And rule number one was that everyone’s name in this show passed a certain era. Their name either has to be something that is – or be something that makes you think of a color. For example, the R in RWBY is stands for Ruby. Weiss in Show 2 is German for white. You know that they’re on a team together. Rule number two was if they’re on a team, it needs to be an amalgamation of four characters who obey rule number one. Their name has to begin with a letter that fits within the acronym that spells the team name that also, just like rule number one, makes you think of something that reminds you of a color. Next up is the B trailer, and you know that the first letter of the character’s name will be “B”. Her name itself is something that either makes you think of – or is literally the word, maybe in another language, the color black, and the same thing for the Y character. John: So you can’t reveal that yet, huh? Monty Oum: Yeah, yeah. There’s a lot of finagling that goes on. It’s coming soon. We have announced that the show will air this July and we expect the time frame between the White trailer, the Black trailer, the Yellow trailer to be pretty much closer than the Red trailer. John: So I want to ask some fan questions from our site. Monty Oum: Absolutely! I love the fans, they are great! John: So here’s one from Ken Ty, and he’s asking if you’re planning on doing any more Dead Fantasy videos? Monty Oum: I love it as a project, but it simultaneously has propelled my career and competes with it. It’s only something that I do in my off-time, considering the license to the characters, the usage of music, and it’s never something that I’ll ever be able to make money off of. So if I ever have time, and I hardly ever do, I would work on Dead Fantasy. As a positive note to that, there are some visions that I have for certain sequences that can only be done with Dead Fantasy characters. So, the short answer is I would like to and someday! John: If RWBY really takes off, it will probably be never? Monty Oum: Well, if RWBY takes off I may. What might happen (and it’s already happening now really) is that we can get a lot more help. I’m not only animating, but I’m also doing everything in terms of design, storytelling, directing and editing. We’ll probably just put more resources to it to help me get more of that free time. Monty Oum: So you never say never really. Monty Oum: Well the choreography mainly comes from a lifetime of watching anime and kung-fu movies. It also comes from some direction. Sometimes, for example, like in the movie trailer, I’ve always had this idea for the sniper sight. I had ideas in my head and essentially the reason for doing the RWBY trailer was to do the resume for what a sniper sight should function like and the moves you can do with it. Now it’s like a fraction of the ideas that I had in mind, but a lot of it comes from engineering. Essentially I have like an engineering mindset that I try to emulate realism, not absolutely adhere to it obviously, because I break a lot of physics but for the sake of – I very often refer to it as dimensionality of realism where it’s inspired by types of movement, sometimes types of dance, things that I see very often and one of the prominent things in the movie especially is the engineering of weapons. I try to put as much thought into what sort of momentum it tries to emulate in reality but do the fantasy version of that and then you build it around that. In the Weiss trailer I would say was a little bit harder to do because it was mostly magic driven and trying to tell the microcosm of a story for her character in that trailer. John: Do you ever just like mime it and just record yourself? Monty Oum: Yeah, actually. Well, I mean, I have a lot of people at my disposal now, more than in the past, but we have a full motion capture studio which I do a lot of performances on. Very often I’m not as good as the other martial artists out there, I just do like the skeleton of a move and then I embellish it in post. It’s almost like you consider it photoshopped for performance. I do the basic move in motion capture, and then I take it into my animation programs and polish it until it’s to a version that I like, almost to the point where I’ve essentially could have just animated it from scratch had I known what the idea was. I would perform in front of camera, in motion capture or just standing up at my desk and making out the thing. That’s something that honestly many animators do. So, yeah, it’s definitely a part of my workflow. John: Yeah, just don’t tell me that you’re doing the motion capture in like a skirt! Monty Oum: Well, yeah, I mean, you know sometimes you’re here by yourself and you’re like, “I need a curtsy,” and then at the end of the trailer I did a curtsy. [laughs] I wasn’t wearing a skirt, but I did have to do that curtsy at the end of the trailer. Monty Oum: I can’t say a lot of – I mean, this time being anime it’s actually about less animation and a lot of it is really done by hand, which is something that I’m going back to often which – I didn’t always have motion captures. So I do a lot of it by not animating and animating it by hand and things that are very static which is true to the art form. John: Last question, what’s the best tip for animators starting out? Monty Oum: I guess the best thing would be to really just start and do it. When I think back to the days when I wasn’t animating, I was always telling myself, if I started now I’m still behind because someone’s going to invent technology down the line to make this easier and why wouldn’t they just wait until then? But then you realize that’s always going to be true and that if you’re just starting out you’ll be ahead of the people that aren’t starting. And the best thing of doing it over not doing it is even if it isn’t great, you’re still going to get feedback and you’re still going to be able to progressively move forward. And so it’s a slow process, but the easiest answer, the fastest answer, although there’s still a lot of work behind it is, you should just do it honestly! And if you have an idea you always want to put on screen, look at someone who’s already doing it and just do what they do.